RDA has developed a new National Training Centre and we are now seeking a dynamic and driven person to lead the work to make this a commercially successful, world class equestrian centre. Based near Warwick, this is an exciting opportunity for the right person to make a significant impact on our work and what we can achieve. The Centre Manager will be responsible to delivering an exciting plan to develop the activities on sire, ensure excellent customer service and manage the facility. The Manager will oversee all operations at the Centre, develop and increase commercial activity, and plan the expansion and next stage of development. Working with our yard team and coaches, s/he will also be responsible for ensuring that the Centre meets the highest standards, allowing it to be an example of great practice to the wider RDA network and beyond. You will be a driven individual, with a passion for what RDA achieves and a willingness to go the extra mile to make sure that the centre meets its targets. You will have a proven track record of managing a facility and managing a team to deliver challenging targets; and you will be dedicated to ensuring we achieve a high standard of customer service. You will be comfortable working with volunteers and support the ethos of a voluntary organisation. RDA is a National federation of charities that enriches the lives of disabled people through activities with horses, by providing meaningful therapy, opportunities for achievement and the joy of working with horses. This National Training Centre is a new venture, which will house our new National Headquarters and will help us underline our commitment to training and supporting our volunteers to continually improve and increase our service. The British Equestrian Federation are seeking two experienced managers to support the Para-Equestrian Dressage team. The British Equestrian Federation is looking for a Performance Manager to lead our highly successful Para-Equestrian Dressage team to international competitions, European Championships, World Championships and Paralympic Games. You will develop a high performance system that consistently delivers medal success at Championship level. 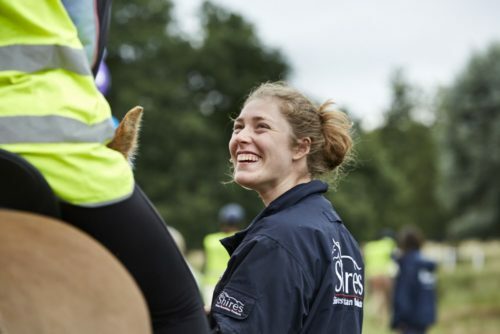 You will be expected to provide leadership and management of the UK Sport World Class Para-Equestrian Dressage Podium programme, working collaboratively to utilise shared knowledge and experience across the programme in order to maximise performance gains and deliver world class medal-winning success. The British Equestrian Federation is looking for a Pathway Manager to join our highly successful team that has consistently delivered medals at international competitions. You will provide highly effective management of the UK Sport Lottery Funded World Class Programme Podium Potential ParaEquestrian Dressage programme and work with the Performance Manager to utilise shared knowledge and experience to deliver an effective Performance Pathway Programme that recognises potential, nurtures growth and drives sustained medal success. You will develop, evolve and implement the technical development framework for para-equestrian dressage athletes to transition to the Podium squad and deliver medal-winning performances. The Elisabeth Curtis Centre is a dedicated RDA centre providing riding for over 100 children and adults with special needs and disabilities. We now have vacancies for two part time grooms to join our team. 28 days paid holiday (including bank holidays) Salary dependant on experience. BHS Stage 2 Care (eQL Level 2 diploma in Horse Knowledge and Care) or the eQL Level 2 WBd diploma in Horse Care. BHS Stage 3 Care (eQL Level 3 diploma in Horse Knowledge and Care), or the equivalent level of WBd. DBS Check will need to be completed. For several years, throughout the whole organisation, the strength of the RDA brand has been under discussion. The milestone of our 50th anniversary seems to have reignited the topic. With strong feelings – and only limited anecdotal evidence – on all sides of the debate, the RDA Board has decided to carry out a research project to gather some real insight into the RDA brand for the first time. 1) To what extent does our current brand hold us back from achieving our aims? 2) To what extent does our current brand help us to achieve our aims? 3) How significant is the RDA brand in creating a sense of belonging among the RDA community? The research aims to include the views of as many people with the RDA community as possible, and will involve one-to-one interviews, focus groups and an online questionnaire. The results of the research will be presented to the Board in June. Depending on the outcome of the research, the Board will then decide whether or not to take any further steps. We hope that you, your participants, volunteers and supporters will want to take part in this discussion. It is important we end up with a range of views from across the whole organisation. Why has the RDA Board decided to research the RDA brand? The strength (or otherwise) of the RDA brand has been under discussion for several years within all parts of the organisation. The milestone of the 50th anniversary seems to have reignited the topic. In order to gain clarity and proper insight into this area – rather than rely on a small amount of anecdotal evidence – the board has decided to undertake this research. What do we mean by ‘brand’? It’s important to recognise that a ‘brand’ is more than just a logo and a name. These elements are important, of course, but so is the language we use to communicate, the values we all try to live up to and the way we behave, both with each other and with the people we serve. All of these combine to deliver a public understanding of what RDA stands for and promises, and this is what we mean by a brand. Are you planning to change the name RDA? To what extent does our current brand hold us back from achieving our aims? To what extent does our current brand help us to achieve our aims? How significant is the RDA brand in creating a sense of belonging among the RDA community? Only when we have answers to these questions will be in a position to contemplate changes to the name or visual identity. Nothing is off the table, but we’re a long way from making any decisions about significant changes. Who is carrying out the research? Following a competitive pitch process, the board has contracted The Frameworks (www.theframeworks.com) to carry out the research. The Frameworks is a specialist design consultancy with a research-focused methodology and an established track record in brand strategy. This research project will cost £20,000. We have an ongoing commitment to investing in research, to make sure that we are as effective as possible and that everything we do is based on an identified need. We are currently spending less than 2% of our total turnover on research and this project represents slightly less than half of that cost. What will happen when the results are in? The Frameworks will present their findings to the RDA board in June. At this point, they may also present some suggestions for next steps, but this is not within the remit of this initial project. It is vital that we include the views of as many people as possible throughout the whole organisation. There will be some one-to-one interviews and focus groups, which you may be approached to take part in. The best way to ensure your views are counted will be through completing the online survey, which opens in April. We will be advertising this widely when the time comes. 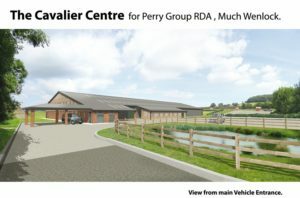 An exciting opportunity has been created at the newly built £1.3m Cavalier Centre, future home of the Perry Riding for the Disabled Group based close to the historic town of Much Wenlock. We are looking to recruit a full time Family and Volunteer Liaison Manager (salary £27,000 p.a. 40hr/wk) to join the core team who will be running this unique facility and creating a centre of excellence for Riding, Vaulting and Driving for the Disabled and engaging with other local and national community-based organisations, “ to deliver meaningful and life changing experiences”. This position is kindly funded by the National Lottery through the Big Lottery Fund until 2022. The successful candidate will have exceptional communication skills, be very organised, compassionate, trustworthy with a successful event planning or organisational background. Should have good experience of working with and training volunteers as well as advising on services and support to disabled and disadvantaged groups of varying ages and abilities. If you believe you meet the above criteria and have the ability to work flexibly, please visit our website www.cavaliercentre.org for more information, to view a detailed job description and download an application form or email barkerj667@gmail.com and request documents to be sent to you. Deadline for the applications is 8th March 2019 and interviews will take place on or after 15th March 2019. The 49th RDA AGM took place in Glasgow under the Chairmanship of the charity’s President, Her Royal Highness The Princess Royal. Held within the splendour of Trades Hall, Glasgow, the AGM brought together delegates from RDA groups all over the UK – many of whom enjoyed a traditional Scottish welcome at the previous evening’s Ceilidh. In her President’s address, The Princess acknowledged that next year’s 50th anniversary would be the time for reflections, but she took time to recognise the experience and expertise within the RDA family, made up of many years dedicated service by RDA’s volunteers and coaches. Delegates were treated to talks from RDA riders Max Stainton, who recently became the first person with Cerebral Palsy to trek to Everest Basecamp on a horse, and Anne Brown, whose dedication to RDA extends to having the charity moto tattooed on her behind! The AGM also offered the opportunity to acknowledge the achievements of outgoing RDA Chairman, Sam Orde, whose time in office officially ends in April 2019. Sam was presented with an Honorary Life Vice Presidency by The Princess Royal, who thanked her for the nine years she has given to the role. The lively programme also included a welcome from The Lord Provost of Glasgow, Eva Bolander and presentations from Stewart Harris, Chief Executive of Sport Scotland, Occupational Therapist Rhona Harkness and Hazel Johnstone of People’s Postcode Lottery. Director of Operations for RDA UK, Claire Milican presented her ‘Top of the Ops’ – a run down of the top ten innovations, improvements and activities delivered by the operations team at RDA National Office during this year. Communications Manager, Caroline Ward, offered a taster of the proposed celebrations for RDA’s 50th anniversary throughout 2019. The Diamond Centre Riding for the Disabled in Carshalton, Surrey is looking for a Yard Manager to join their professional team. This is a live-in position. The successful candidate will be highly motivated, well organised with excellent communication and stable management skills. They will be responsible for the management and care of the Diamond’s ‘Stable Assets’ which include 30 horses and ponies and associated tack, land, arenas and equipment. They will work as a member of the management team who will develop, maintain and supervise a teaching programme to meet the objectives of The Diamond Centre – that being the provision of riding and driving for disabled children and adults. They will have at least a BHS AI qualification and a minimum of 3 years practical experience in yard management. The package includes a self-contained 2 bedroom flat on site along with a competitive salary. A new study is set to reveal the motivations and benefits experienced by volunteers who give their time to RDA. The biggest survey of its kind carried out by RDA aims to capture information from as many of the charity’s 19,000 volunteers as possible. The results of the survey will be added to a qualitative study on the same subject. Both elements will form part of a White Paper to be launched in Parliament during the Spring of 2019 as part of RDA’s 50th anniversary. The survey will be circulated to groups and will also be available on the RDA website, Twitter and Facebook pages. “We are urging all volunteers to take part. It doesn’t take long to complete and will give us valuable insight into the difference volunteering can make,” says Matt. For our 50th anniversary in 2019, RDA UK is running an external facing publicity campaign with the aim of raising awareness of RDA to the general public. The campaign ’50 faces’ will comprise 50 portrait photographs of people within our organisation who challenge the perceptions of disability, volunteering or equestrian sport. The resulting portraits will form an interactive collage which will be used as a focal point for the RDA website, media campaign and social media throughout our 50th. We will visit all our chosen participants to take the portrait and interview them. 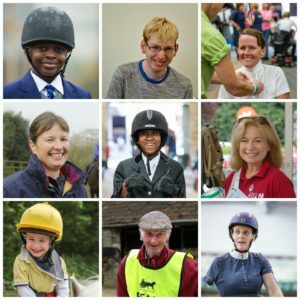 This will be a unique and engaging piece on the individual, their background or their RDA journey and will help to show the diverse range of participants and volunteers that make up RDA. Please email Beth Randles with a picture and brief background information about yourself, this will help us to choose a range of people from all different areas of RDA whether you are a volunteer, participant, parent or paid member of staff – we would like to represent everyone. What should i include in the email? Please be aware if you would like to participate in this campaign it is important that everyone involved feels comfortable with their name, image and story being publicly available and shared by RDA in print, broadcast and online- including social media. We hope to generate interest from the media through this campaign, so possible candidates should consider if they are happy to talk to journalists around their involvement with RDA (with support and guidance from us).